Gathered darts regularly feature on vintage garments. There's a simple way to get this effect, using a pattern you probably already have in your stash. 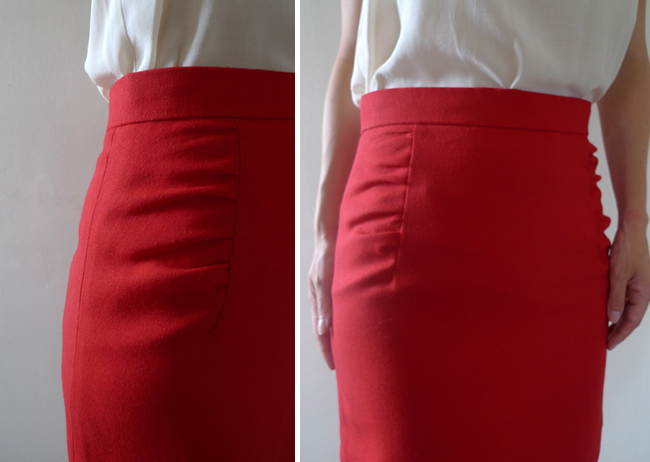 You can use any basic skirt pattern that has two darts on the front, ideally a pencil (shown here) or A-line. If you don't already have something appropriate you could use something like Simplicity 5259 or possibly New Look 6843. However, pick something where the darts are prominent, by both their position and length. Or, experiment with another shape if you like! The effect will be different but the principle is the same. 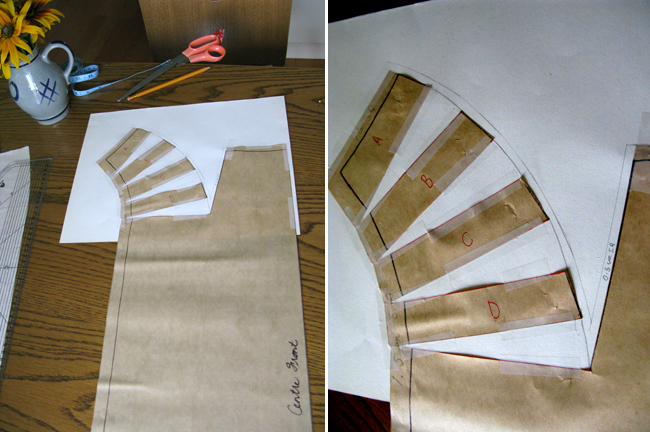 You could also use a dress pattern as your starting point, where the skirt has two front darts. 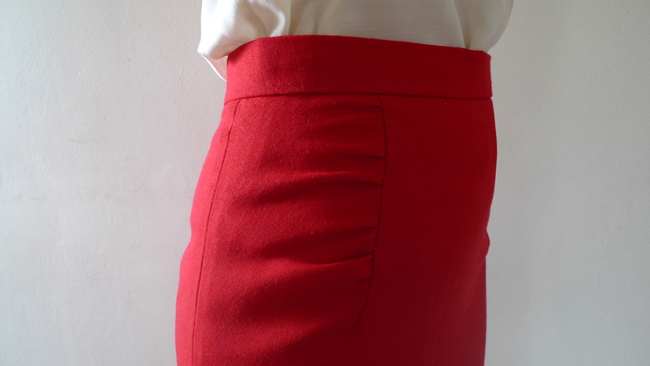 Just trace off the skirt and add a waistband. Burda's Little Black Dress 10/2011 would probably work. First, measure the length of the dart furthest from the centre front. In my case it's 12 centimetres. Divide the length of the dart leg by four. 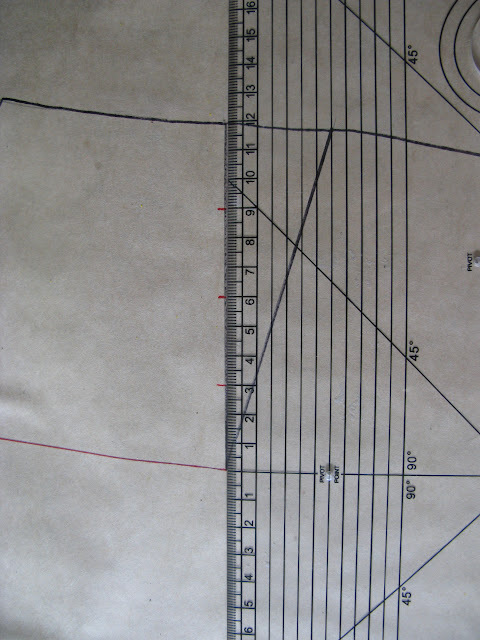 Then draw four lines across at these points, at a right angle from the centre front. Since I'm using a block, I added my seam allowance - along the side seam and the waist only - now. Now cut out the dart. 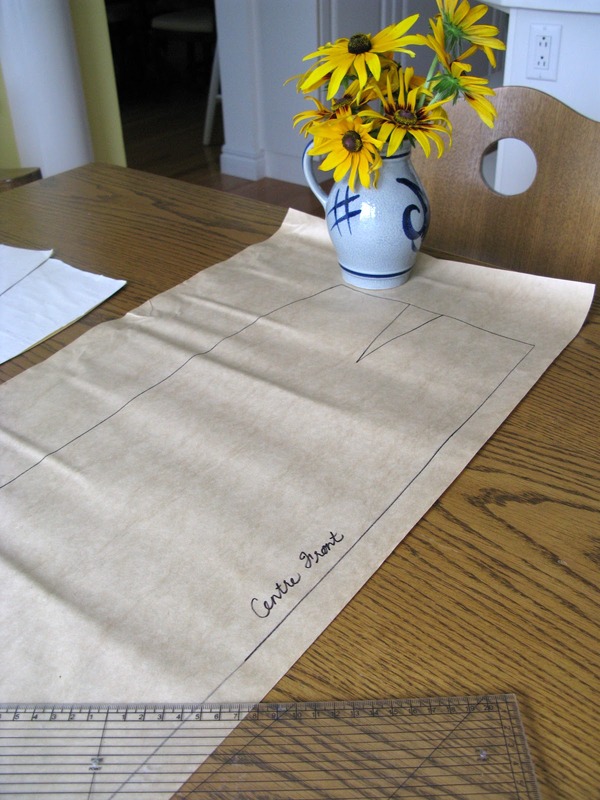 Then cut across each of the lines you just drew, to the edge of the seam allowance. Now here's the bit of math: My dart leg was originally 12cm and I'm going to double it to 24cm. 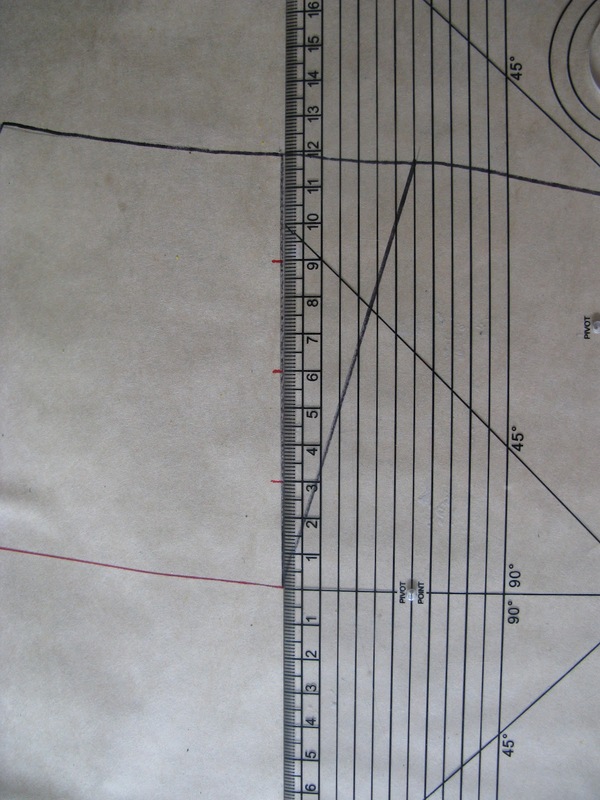 That means I have to add 3cm between each 3cm strip to make 24cm total. Keep in mind, this is not a science, as long as your strips are spread evenly you will achieve a nice gather, whether the dart leg ends up being 22cm or 26cm. 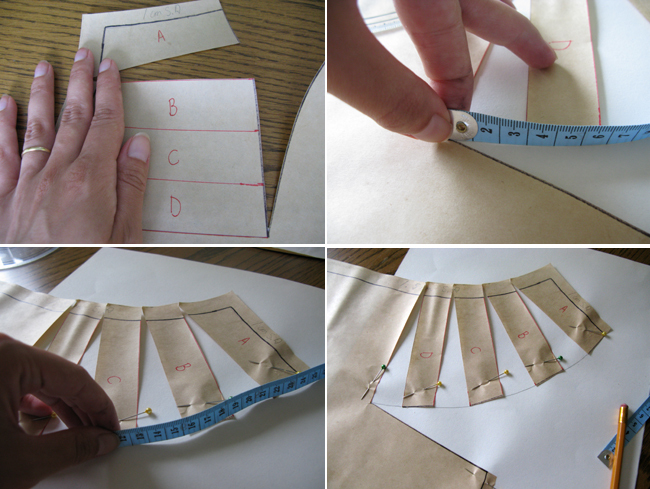 Once you've decided on the placement, pin the strips in place. Then add a seam allowance to the dart itself. I made mine 0.5cm to reduce bulk. 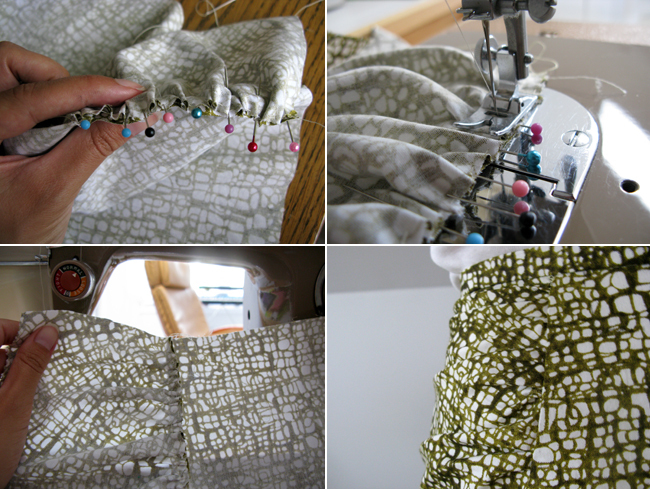 ...use pins to keep in place, and sew! What a great idea, your skirts are really nice! I'm definitely going to try it out. Thank you! I'd love to see your version when you do! Thank you, this looks so great, and easy too.I am going to give it a try! Oh good I hope I can see it when you do! Thanks so much for posting... it worked beautifully. I linked back to your blog from mine. Yay so happy to hear it! Going to check it out now! Hello, thank you for the nice comment & good luck with it! Thanks so much for this tutorial! I can't wait to try it!